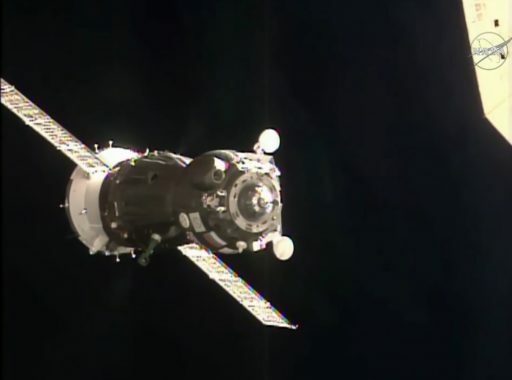 Trained for manual flying and building on extensive flight experience, Soyuz commander Yuri Malenchenko guided the Soyuz back to is docking port after the spacecraft started backing away in its initial approach to ISS due to a problem not yet fully understood. Stabilizing the spacecraft, Malenchenko lined up with the Rassvet module and conducted a manual docking at 17:33 UTC, marking the crew’s arrival at their home in space for the next six and a half months. Experienced Soyuz Commander Malenchenko, ISS-veteran Tim Kopra and Tim Peake, the first British Astronaut to visit ISS, have a busy schedule outlined for their seven-month stay living and working aboard the orbiting laboratory. Sixth-time space flier Malenchenko and his Flight Engineers Tim Kopra, returning to ISS after six years, and Tim Peake, the 221st person to visit ISS, climbed into their Soyuz spacecraft two and a half hours prior to their pre-sunset blastoff. Sitting atop 274 metric tons of propellants, the three crew members went through their final preparations while their Soyuz FG rocket was revealed atop the launch pad at Site 1/5, the very same pad Yuri Gagarin lifted off from on his historic mission in 1961. Soyuz FG soared to life for liftoff at 11:03 UTC, climbing vertically for a short moment before pitching over and starting a north-easterly departure of the Baikonur Cosmodrome, chasing after the Space Station that had passed over the launch site just minutes before liftoff. 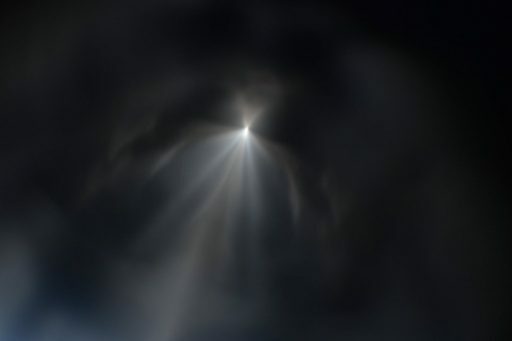 Climbing into clear skies over Baikonur with a total thrust of 422 metric-ton-force, the Soyuz fired its four boosters for nearly two minutes before they made a clean separation, showing off the Korolev cross for a split second as the spent boosters rotated outward away from the core. Powered by the core stage and its RD-108A engine alone, Soyuz continued ascending with a total thrust of 94 metric ton-force. Departing the dense atmosphere, the rocket separated the protective launch shroud, exposing the Soyuz spacecraft and giving the two Tims window seats as they headed towards their first orbital sunset. The all-pilot crew got a turbulent ride when stage separation took place. The crew trio was catapulted forward when the core stage shut down 4 minutes and 45 seconds into the flight. Ignition of the RD-0110 engine on the third stage two seconds later pushed the crew back into their custom-fitted seats and was followed split seconds later by the separation of the stages. Firing for nearly four minutes, the third stage delivered 30 metric tons of thrust to give the Soyuz the final push to orbit. Soyuz TMA-19M separated from its booster eight minutes and 48 seconds after liftoff, entering an orbit of 201 by 253 Kilometers – trailing ISS by over 3,000 Kilometers, but catching up very quickly in its orbit, 200 Kilometers lower than the Space Station’s orbit. 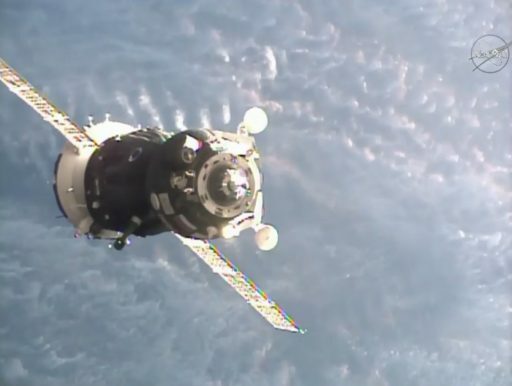 Moments after spacecraft separation, the Soyuz deployed its two power generating solar arrays and KURS antennas followed by the pressurization of the propulsion system and dampening of the spacecraft’s body rates. Heading out of communications range, the crew was told they could open their helmets and work through their checklist as written. To begin the climb to the Space Station right away, the Soyuz conducted a pair of SKD main engine burns on its first lap around the Earth. These two maneuvers, performed in the blind, raised the spacecraft’s orbit by around 100 Kilometers before the crew could again check in with Mission Control when passing over Russian Ground Stations. 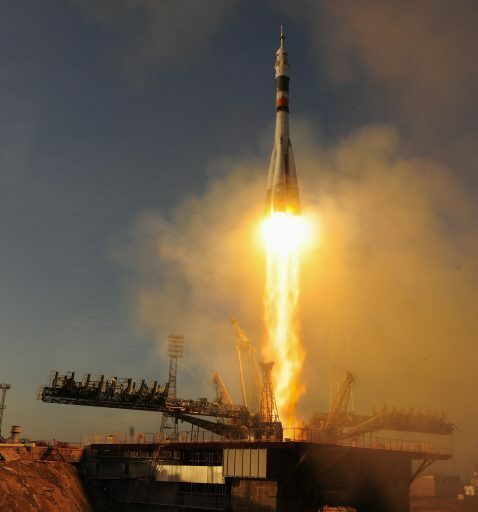 Soyuz was tracked after launch and ballistics experts calculated a pair of maneuvers for the second orbit to put the Soyuz into the correct spot for the Automated Rendezvous Sequence to start. When passing over Russian ground stations, the crew tagged up with the ground and continued setting up the spacecraft’s systems for its high-speed link-up with the Space Station, also checking out the vehicle’s manual flight controls. 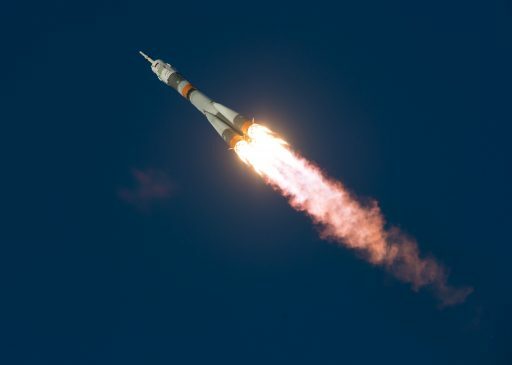 Soyuz entered its fully automated rendezvous sequence on its third orbit around the planet, starting with the final ground-targeted rendezvous burn that placed the spacecraft on a path into the 200-Kilometer communications zone around the Space Station. Acquiring KURS Navigation Signals from the Space Station, Soyuz automatically calculated its subsequent rendezvous maneuvers, targeting a point one Kilometer from ISS. The navigation system was put through a series of tests and Yuri Malenchenko kept close watch over all Soyuz systems, ready to fly manually in the event of a problem. Heading into the final five Kilometers, Soyuz hit the brakes and fired its engines to slow down as ISS grew bigger and bigger as seen by the Soyuz craft. At a distance of 400 meters, Soyuz TMA-19M initiated its flyaround sequence, making a slow lap around the orbiting outpost to get lined up with the Rassvet module. 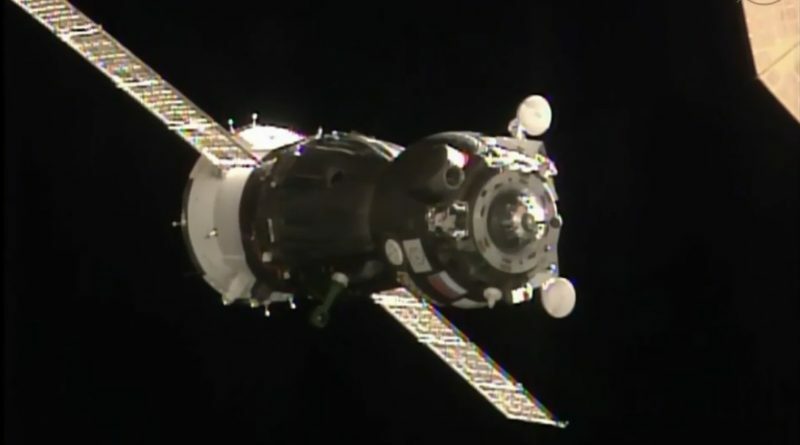 The spacecraft continued closing in on the Station while making its flyaround, guided by its KURS navigation system which remained in automatic mode with no signs of issues. Lined up with the Rassvet module at a distance of 200 meters, Soyuz rolled to position its solar arrays and came to a halt to enable teams to make a short alignment and systems check before radioing up to the crew a GO for command final approach to start. Gently firing its thrusters, the Soyuz started closing in on its docking port at a slow rate while keeping its crosshairs perfectly aligned. The docking mechanism was powered up and the spacecraft retracted one of its KURS antennas in the last few meters of the approach. Inside 20 meters, Soyuz suddenly fired its thrusters in an abort maneuver – rapidly backing away from the Space Station as is the design for a situation in which the KURS system is no longer providing navigation data to the onboard computer. Yuri Malenchenko immediately assumed manual control and stopped the opening rate, however, Soyuz had started drifting and needed to be brought back into alignment with Rassvet. 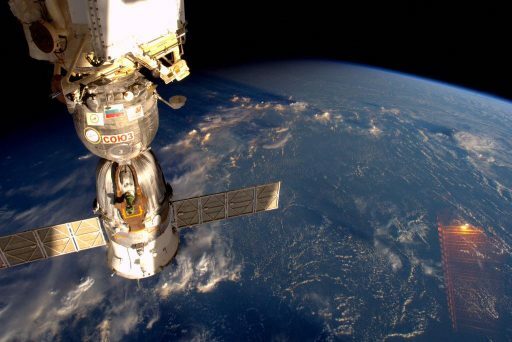 The issue occurred at 17:15 UTC when the Control System of the Soyuz provided a General Failure Message after closing in to around 17 meters to ISS. The Automatic Control System conducted a DPOb abort designed for general failure scenarios in which control of the spacecraft is left to the hands of the commander. Malenchenko, making his fifth flight on the Soyuz in a spaceflight career of over two decades, remained very calm and took several minutes to get a feel for the controls and carefully maneuvered the Soyuz back to a position directly aligned with Rassvet. At Mission Control, Soyuz telemetry was lost and the team heavily relied on commentary from Malenchenko to follow the progress of the rendezvous after ISS and Soyuz departed Russian ground station range and communications were limited to the voice loop coming via the Tracking and Data Relay Satellites. Soyuz commanders complete hundreds of manual docking simulations in the run-up to a mission in various off-nominal modes and Malenchenko can look back at previous experience flying spacecraft in manual mode. During his first mission to the Mir Space Station, he completed a Progress resupply craft docking using the remote-controlled TORU mode and, on the same mission, he was in charge of a manual Soyuz undocking – re-docking maneuver. 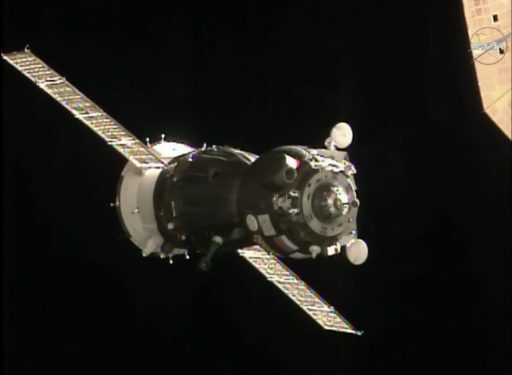 Recovering vehicle stabilization, Malenchenko brought the spacecraft close to ISS so the crew could visually observe the docking target as orbital night had set in during the extended Flyaround. He reported a good alignment and initiated a final approach to docking. 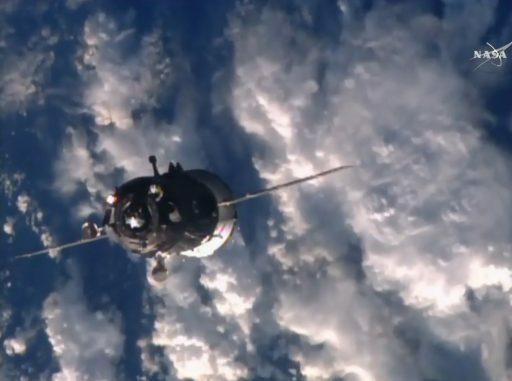 Contact and Capture occurred at 17:33:29 UTC as the docking probe of the Soyuz slid into the docking interface and capture latches engaged to hold the spacecraft in place. Flying six hours and 30 minutes from liftoff to its on-time docking, Soyuz TMA-19M linked up with ISS 400 Kilometers above the Indian Ocean. After their successful arrival at their orbital destination, the three crew members were finally able to take off their Sokol launch and entry suits and change into more comfortable clothing. Ahead of the crew prior to hatch opening was the typical one-hour leak check to ensure the pressure seal within the docking interface was tight as well as a series of reconfigurations of the power and communications systems of the Soyuz. 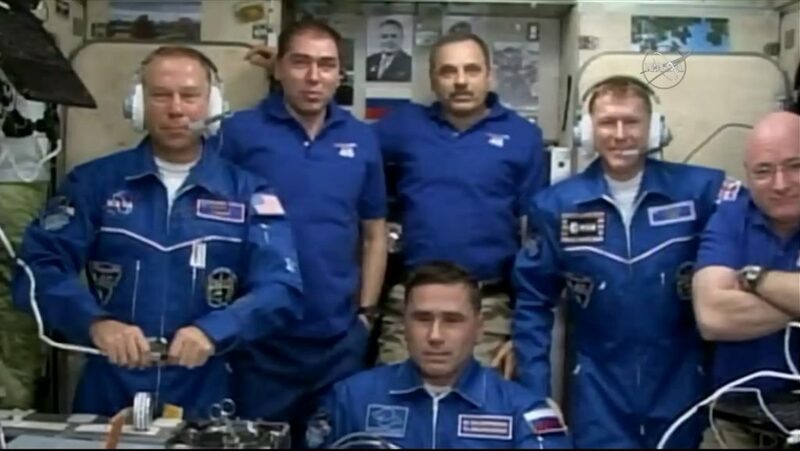 Hatch opening occurred at 19:58 UTC and the three arriving crew members received a very warm welcome by the resident crew with plenty of hugs being exchanged as the two ISS veterans and first-time space flier floated aboard the complex. Kelly and Kornienko are welcoming their third visiting crew as part of their yearlong stay on ISS. To put an end to a very long day, the crew will participate in the traditional family conference, conduct a safety briefing and get settled aboard their sleeping quarters for some well-earned rest. 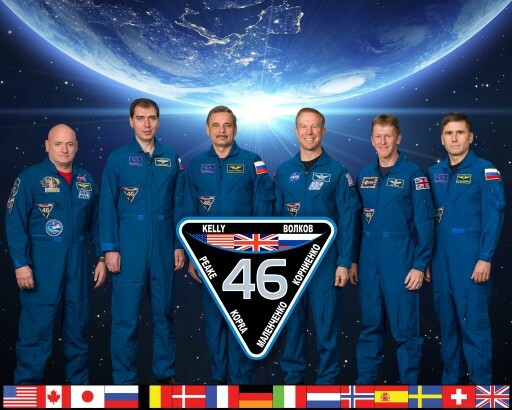 Arriving for a stay of six and a half months, the three crew members are facing a packed timeline for ISS Expeditions 46/47. Malenchenko, Kopra and Peake will support hundreds of scientific experiments, transfer thousands of Kilograms of cargo to ISS, conduct spacewalks and oversee the completion of the first yearlong Expedition to ISS. The combined six-person will not get a break ahead of the holidays as cargo operations involving the Cygnus OA-4 spacecraft are getting underway in earnest later this week and on the Russian side, cargo ops will also be a focus of attention as the Progress M-28M spacecraft is packed with trash for its fiery return to Earth. The launch of the first Progress MS spacecraft featuring the latest technical upgrades to be implemented across the Soyuz and Progress fleet is set for liftoff on December 21 and arrives at ISS two days after liftoff. When Progress is on board, ISS will enter a period of high beta angles, meaning that no spacecraft traffic can be in- or outbound and no spacewalks can take place. This will allow the crew to settle down for a few days over the holidays as support operations on the ground also wind down to a minimum with only a few critical experiments and maintenance operations on the schedule. In the new year, the crew will have their hands full with science operations, but also prepare for a pair of spacewalks in January and February – one from the Quest airlock by USOS crew members to switch out a failed electrical box and the other by Yuri Malenchenko and Sergei Volkov to take care of reconfigurations on the Russian segment. However, the primary focus of the upcoming months will be over 200 experiments ongoing aboard the Space Station. Throughout Expedition 46, the majority of the crew’s time will be dedicated to science operations, supporting over 200 studies ongoing aboard the orbiting laboratory. Science supported by the Space Station spans across all branches from Earth and Space Science over physical science, technology demonstrations, biology, biotechnology, chemistry and human research to educational activities and student-run experiments. The one-year mission is the first of its kind conducted on ISS to deliver data that was previously unavailable. Gaining data on degradation occurring beyond the standard half-year mission will deliver extremely valuable insights needed in the development of countermeasures for future space missions that will last one year and beyond. ISS Expedition 46 will welcome the SpaceX Dragon on its return to flight mission before Kornienko, Kelly and Volkov board their Soyuz TMA-18M spacecraft in early March to head back to Earth. Expedition 47 will continue into June and see more science, spacewalks and visiting vehicles including the next crewed Soyuz mission. 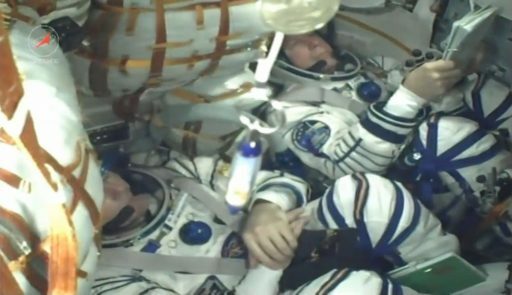 Malenchenko, Kopra and Peake are booked to stay on ISS until next June, currently looking at a return date of June 5, 2016.